Back in 2005, I was minding my own business one Sunday morning when my husband asked if I'd like to go to a meeting the following week about an upcoming trip to Kenya. I believe I responded graciously by saying something along the lines of, "Are you crazy? Have you not been paying attention the last 7 years?" You see, I had been suffering from chronic pain for every moment of those years. Pain so extreme, initially, that I thought if God had any mercy He would just let me die. Pain so severe, I could barely walk using a cane; there were even times I had to resort to using a wheelchair. It had been a year of downward spiral, followed by a long, slow recovery (16 years now, and counting). At that point in time, I could manage to be on my feet for maybe a half hour and could ride in a car an hour max. A trip to the shopping center was a major excursion and generally required two days of recovery. So you can see why I thought my husband was crazy. But he assured me that he didn't want to travel to Africa, he just wanted to hear about the trip. Actually, I didn't fall for it; God talked me into it by convicting me of not being a very supportive wife. So I agreed to go to the meeting, selfishly (and, it turns out, foolishly) thinking that I could earn some "good wife points" by going. My plan was simply to be honest about my physical condition, take their rejection gracefully, and that would be that. I remember thinking, "What's an hour out of my life?" You can file that under "Famous Last Words." Because the meeting did not go as I planned. What was the matter with those people anyway, willing to take someone as incapacitated as yours truly to do mission work halfway around the world? I didn't know how I'd even manage the 24 hours of travel to get there, let alone function once I arrived. I'm very fond of both those things. I left that meeting praying like I had never prayed before, (but not in the way I should have,) "God, please make it clear that this is some terrible mistake!" But that's not what He did. In fact, it was quite the opposite. It was so beneficial because what God was saying was exactly the opposite of my human reasoning. Whenever I would have myself talked out of going, (which was often!) I would read through the list, and as I did God would reassure me that this was, indeed, His plan. My arguments didn't hold up any better than Gideon's did. How could I possibly argue with this? The answer is, I couldn't. I made that list back in 2005 but I haven't felt the need to do it since...until now. God is moving and I can hardly tell which end is up. So I've started another list, and every time I begin to freak out because my life feels out of control I go back and read it. And see how He's been at work. And recognize that I'm exactly where God wants me to be. You can read about my first experience in Kenya here. Oh, Lisa, this is biblical in proportion! He is using someone so unexpected (you!) to accomplish His work. How wonderful. "No electricity, no running water - I am fond of both of those things." Ha ha. I love your list! Found you at Barbie's link and as a journal keeper drawn to your page. It is ironic because I am about to post a list myself on my own blog! Journaling scripoture, writing our thoughts prompted by God really helps clarify and recall his will and faithfulness, yes? Love your sharing! Maybe when you can , you would consider joining our Journal Link, at some point! As a chronic pain sufferer I was touched by your post. I love how God walks right into our circumstances and leads us--where we would never have imagined we could go. You poured hope on me today, Lisa. God's reasoning is so different from our human reasoning. I loved that you shared His Word which trumped your own reasoning. 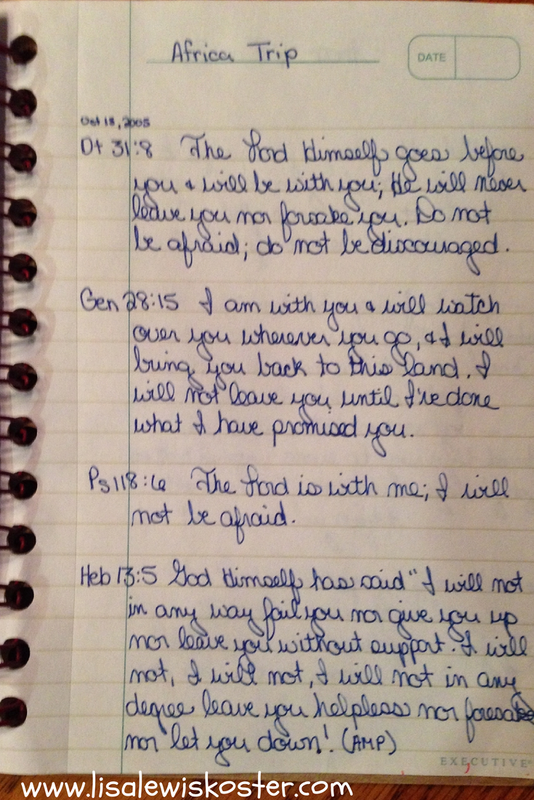 A wonderfully encouraging post, Lisa, to remind us to let God's Word always have the final say. Blessings! 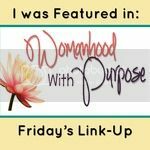 Dear Lisa, I found your blog through a link up. I love your writing! I write to high school and college age girls, but I love hearing from older women in the Titus 2 way. I'll be visiting again :) I had to laugh at this part of your post: 'Oh, and no electricity. I'm very fond of both those things." God often works like that, doesn't He, Lisa? He turns our "absolutely not" on its head and gives us more than enough grace and strength to meet the challenge. I'm so glad you didn't let your pain and disability get in the way. I don't know your health story, but you've got me curious. 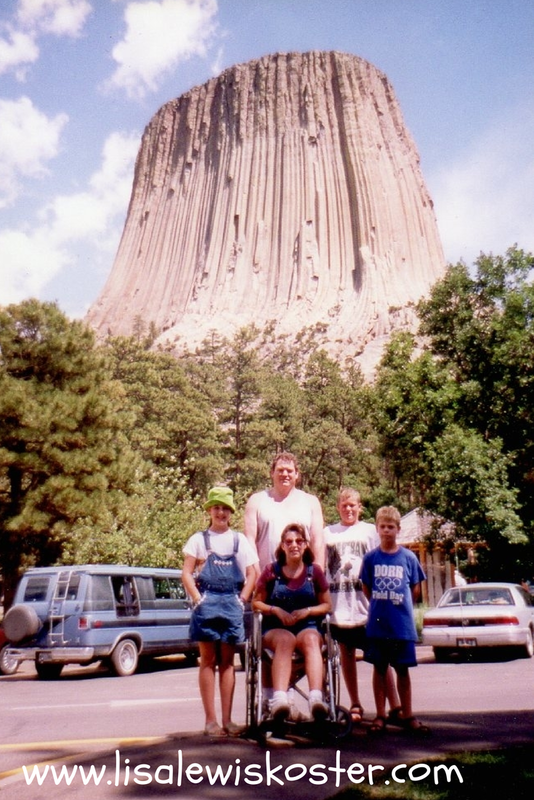 I've had Rheumatoid Arthritis for 20 years and would worry about taking a trip like that as well. It's hard enough to travel when I have all the amenities that come with a "vacation," much less a trip to Africa! Whoa! I admire your sacrifice and devotion to God, my friend! Lisa, this simply makes me smile. And I just love your act of obedience and trust in Him. The verses you shares are all ones I've clung to as my husband prepared for His deployment and throughout our time apart. Thank you for sharing with Three Word Wednesday. Blessings to you. 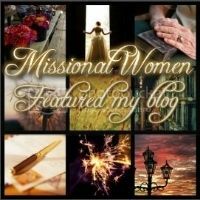 I just found your blog and look forward to reading more of your posts this week. I am in the slow process of recovering from Lyme's disease that went undiagnosed for over a year....I too have chronic pain. it is so exciting and encouraging to see what God has done in your life through this struggle! Wow! Great Post! Surely the Lord's will, will always prevail. Amen! I was greatly encouraged by your experience. WOW!! Only 32!! What a wonderful story. I really was encouraged reading this.